UPDATE: Penang state government has clarified that no approval for the construction of the light rail transit (LRT) and Pan Island Link 1 (PIL 1) project yet. “We can expect construction work for both projects to start in June 2020,” sources said. Earlier, it was reported that the construction work for LRT might start in early 2020. Both the LRT and PIL are components of the RM46bil Penang Tran­sport Master Plan (PTMP) which has met with resistance from va­­rious conservation groups. 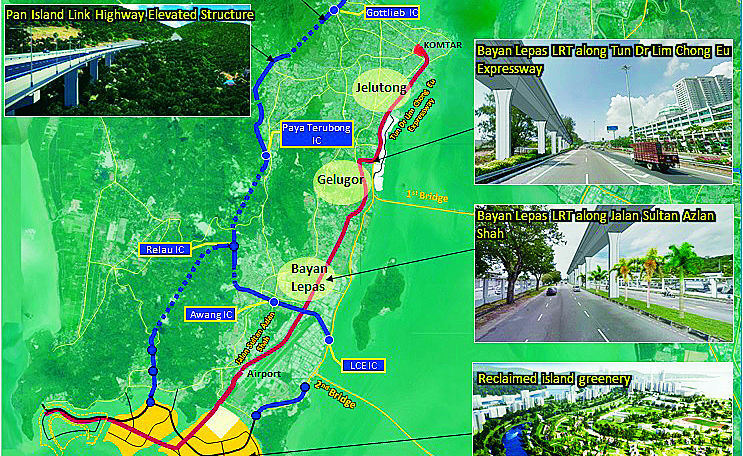 The LRT begins from Komtar in the northeast corner of the island and passes through Jelutong, Gelu­gor, Bayan Lepas and the airport before ending at Island B, one of the three man-made islands proposed under the Penang South Reclama­tion Scheme (PSR) to accommodate the state administrative buildings and offices. The SRS Consortium – a 60:20:20 joint venture involving Gamuda Bhd, Loh Phoy Yen Holdings Sdn Bhd and Ideal Property Develop­ment Sdn Bhd – is the project delivery partner, appointed by the state government overseeing the implementation of the PTMP. The SRS’s role is to supervise the projects until their completion and to scale down the cost. The sources said approval for the PSR to create the three man-made islands totalling 1,821ha was likely to be given by the National Physical Planning Council before the end of this month. “The tender to reclaim the island will be out in the third quarter of this year. “Reclamation work is expected to start in the first quarter of 2020. “There will be a need to construct a dam and three power plants for the islands. “Island A will house indus­trial and residential projects. “There will be industrial lots developed for sale to foreign and local investors to generate funds for the PTMP projects. “Island B will accommodate the state administrative offices and commercial properties while residential properties will be developed on Island C,” the sources said. They said SRS Consortium was expected to raise RM46bil from sales of the islands. “About 75% of the 1,821ha will be for sale. The sale of the industrial lots has generated a lot of enquiries. “Some 30% of the enquiries received so far is for the industrial land,” they said. In the past, non-governmental bodies such as the Penang Forum and the Penang Citizen Awareness Chant Group have opposed both the LRT and PIL, urging the state go­­vern­ment to look at other options. Last year, Chief Minister Chow Kon Yeow said that the major components of PTMP would be fully funded by revenue genera­ted from the sale of reclaimed land of the PSR project. i saw the news in The Star today… finally and totally… it’s also my Whatsapp Status. First time im posting in my Whatsapp. First time im using whatsapp status. loll This news really made my day..
Haiya, you see ! Again it’s NATO lah ! 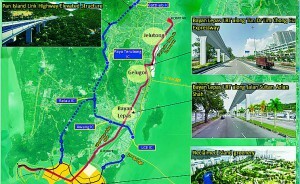 Penang CM denies PIL 1 project, LRT Line to begin construction next year ! Got, create money from land reclamation mah. But don’t think money can just be created out of thin lah. They try to fool the rakyat by calling it a “Private Finance Initiative”, creating a false impression that the money is coming from certain private companies. But effectively, the money will finally come from penang people. Why? Because the reclaimed land will have to find a buyer someday, who would eventually build houses and sell back to penang people. That’s the final source of funding. So instead of money coming from federal (part of which comes from taxation in PG), now the money being used to build this PIL & LRT will come from penang people directly. So penang people are paying twice, one time to federal as tax, and the second time when they buy houses on these reclaimed land. Simple!